Highline at the Terminal Building. All images courtesy Indovina Associates Architects. When construction was completed on the South Side’s Terminal Warehouse and Transfer Company complex in 1906, it was considered the largest, safest and most efficient storage and transfer building on the Eastern seaboard, says Izzy Rudolph, director of development and acquisitions at McKnight Realty Partners. More than one hundred years later, McKnight has begun construction on a multi-million dollar transformation of the six-story structure from a nexus of commerce to a riverside hub for office and retail space. It will be capped by an elevated, 500-foot-long park, the Highline. 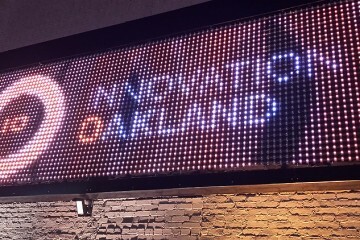 “We’re taking it into the next generation by really modernizing the building soup to nuts,” says Rudolph. Buildout began this week on 125,000 square feet of new office space inside the 800,000- square-foot structure. This phase of construction is scheduled to be completed by second quarter 2018 and will include new common areas, fitness centers, windows, HVAC, and a fire and life safety system. In addition, 350 new internal parking spots will be completed by first quarter 2018, with more to come. The hulking brick structure, located at 333 East Carson Street, transitioned from storage to office space beginning in the 1980s and is currently known as the River Walk Corporate Center. What appears to be two separate buildings bisected by a street is actually a single structure, and in 2013 it was listed on the National Register of Historic Places. Besides office space, the property will look to attract 100,000 square feet of retail, including 15,000 square feet along East Carson. Another stretch of retail will be along S. 4th St. near Bingham St. and the nearby, trail-facing “railyards” portion (where trains used to arrive to transport newly imported goods to the surrounding areas). Rudolph says they want to shy away from the negative aspects of South Side nightlife and have so far held discussions with local bakeries, fitness centers, bike and kayak rentals and even craft breweries about setting up shop in the space. The most transformational part of the building, he says, remains the Highline. 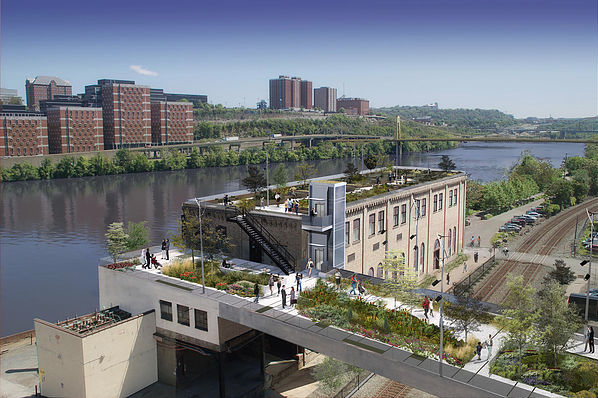 Modeled after the 1.5 mile long parklet created on the elevated former railroad in New York City, the Pittsburgh version will extend from near the entrance on East Carson and over the present CSX rail lines to an overhang that will overlook the Monongahela River and city of Pittsburgh. Powerhouse building. Courtesy Indovina Associates Architects. The Highline is currently scheduled to open around July 2018. “It will be one of the most unique green spaces in the state of Pennsylvania,” says Rudolph. 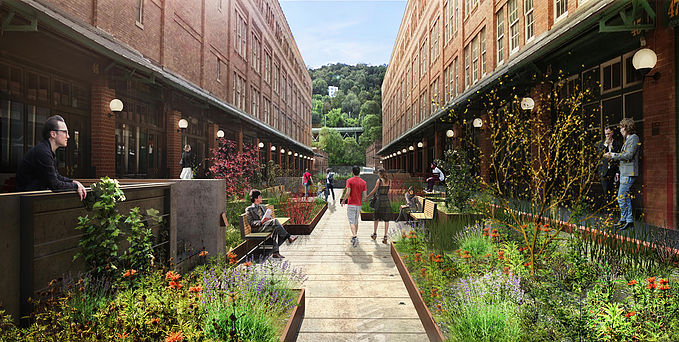 The Highline will terminate at the second floor of the 15,000-square-foot powerhouse building. Rudolph envisions the riverfront structure as two-story restaurant space, possibly with separate concepts on either floor. “It screams out waterfront eating,” he says. The lower floor of the powerhouse building abuts the Three Rivers Heritage Trail, which currently detours around the Terminal Building. Rudolph says he hopes to reconnect the trail “in the very near future,” along with adding upgrades to the outdoor promenade to make it more bike and pedestrian friendly. Indovina Associates serve as project architects. For more information on the project don’t miss our story from 2016.